Please join us for today’s service led by Rev. Paul Dodenhoff. 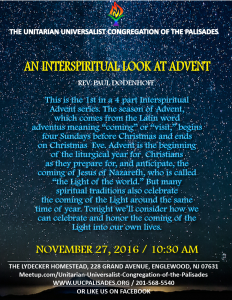 This is the 1st in a 4 part Interspiritual Advent series. The season of Advent, which comes from the Latin word adventus meaning “coming” or “visit,” begins four Sundays before Christmas and ends on Christmas Eve. 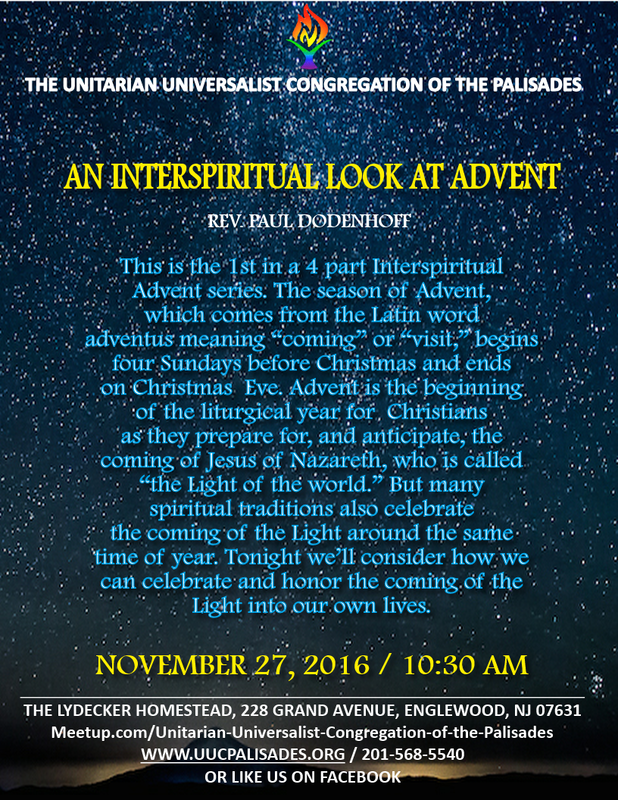 Advent is the beginning of the liturgical year for Christians as they prepare for, and anticipate, the coming of Jesus of Nazareth, who is called “the Light of the world.” But many spiritual traditions also celebrate the coming of the Light around the same time of year. Tonight we’ll consider how we can celebrate and honor the coming of the Light into our own lives.